Masquerading as finely rendered art pieces, the pop cultural and socio-political commentaries of Ron English are accessible to everyone in one form or another, whether it be his street art murals, gallery exhibitions, affordable book collections, or designer toy sculptural editions. Spreading his self-proclaimed POPaganda campaign through an unforgettable cast of characters, even the most inattentive persons have surely been exposed to English’s creations through appearances like those of his morbidly obese fast-food mascot MC Supersized‘s inclusion in 2004’s Super Size Me documentary film and his Abraham Obama hybridization of the 16th and 44th United States presidents’ likenesses used by the media during the 2008 presidential elections. And for those that deliberately seek out English’s art, they are treated to the reoccurring imagery of two-faced rabbits, anthropomorphic cows as cowgirls, elongated grins that expose the skull underneath, and even something similar to a certain muscle-bound, green superhero though reimagined with a baby’s roundish face, a character that English has titled both as The Incredulous HulkBoy and the Temper Tot. Due to the nature of English’s prolific output across various mediums, it can be difficult to unquestionably identify the debut of characters, though it is safe to state that The Incredulous HulkBoy‘s painted canvas and sculptural appearances within September of 2010’s Status Factory solo exhibition at New York’s Opera Gallery garnered the design significant national and even international attention. And while the 22-inch tall high-density fiberglass sculptural rendition would be issued in an edition of 10 signed & numbered pieces produced by Garage Works Industries in 2012, English revisited the concept several times during the interceding period, including two depictions in the Seasons in Supurbia solo exhibition at the Corey Helford Gallery in November of 2011. One of these works was Comic House Block Party which included the character in his raging stance reminiscent of The Incredible Hulk, while the There Goes the Neighborhood had a much more pensive posture, one which would become synonymous with its Temper Tot identity. Announced near the end of 2012, English’s terrifically strong and terrifyingly immature Temper Tot is a roughly 8-inch tall vinyl sculpture that has been released in several colorful editions since its debut, as well as unveiling quote-unquote lifesize renditions as part of a solo exhibition at Secret Fresh in December of 2014. After a brief hiatus of the form appearing sculpturally, an extra white Limoges porcelain edition was issued in May of 2017, produced by K.Olin Tribu who had established their name by casting outré art in this ceramic material ever since their founding in 2009. Standing roughly 7-inches tall, 4-inches wide, and 2½-inches deep, this new version was limited to an edition of 50 pieces, each completely finished and reworked by hand to ensure the finest quality, the porcelain kept free of enamel to ensure that all the details of its musculature are defined and prominent. 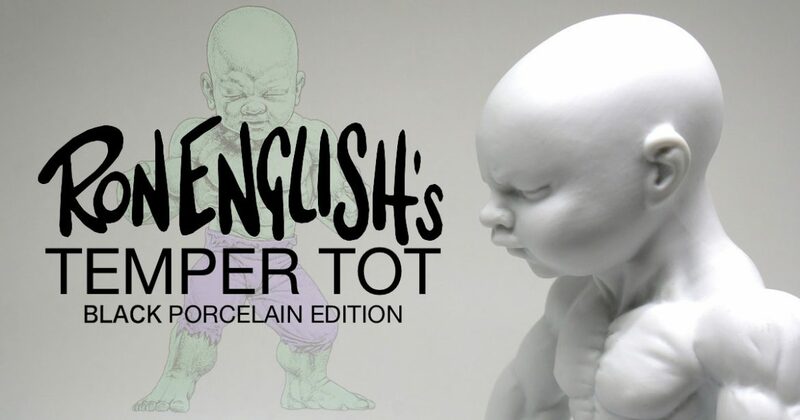 And, revisiting this again, English has partnered with K.Olin Tribu once more to issue a new 50 piece edition of the Temper Tot form in porcelain, this new version featuring black decoration on the character’s torn pants. As for the intent behind the Temper Tot character, it embodies the “combustible amalgamation of unbridled id and unbounded brawn”, as the solicitation text for the original vinyl sculpture states, with English adding in an interview that this tantrum throwing toddler “is America”, specifying that his creation is “all misdirected anger and prideful immaturity” as well as being “more self-possessed than self-aware, both jealous of and threatened by the image of himself he presents to the world”.1English, Ron. “Ron English Interview & Studio Visit“, interviewer Rom Levy. StreetArtNews. June 16th, 2015. And this idea of a muscular form tempered by a super fragile ego makes the character’s transition into porcelain perfectly appropriate, the material emphasizing the delicate nature of the Temper Tot‘s emotions. Click Here to Purchase Ron English’s Temper Tot (Black Porcelain Edition) pieces. 1. ↑ English, Ron. “Ron English Interview & Studio Visit“, interviewer Rom Levy. StreetArtNews. June 16th, 2015.